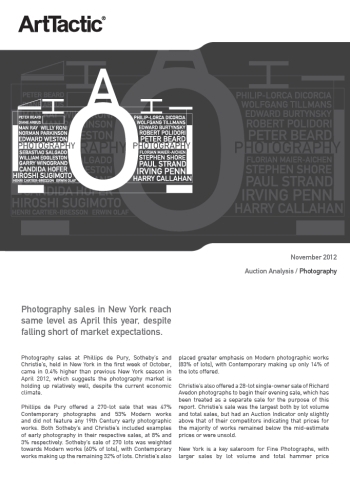 Photography sales in New York reach same level as April this year, despite falling short of market expectations. Photography sales at Phillips de Pury, Sotheby’s and Christie’s, held in New York in the first week of October, came in 0.4% higher than previous New York season in April 2012, which suggests the photography market is holding up relatively well, despite the current economic climate. Phillips de Pury offered a 270-lot sale that was 47% Contemporary photographs and 53% Modern works and did not feature any 19th Century early photographic works. Both Sotheby’s and Christie’s included examples of early photography in their respective sales, at 8% and 3% respectively. Sotheby’s sale of 270 lots was weighted towards Modern works (60% of lots), with Contemporary works making up the remaining 32% of lots. Christie’s also placed greater emphasis on Modern photographic works (83% of lots), with Contemporary making up only 14% of the lots offered.